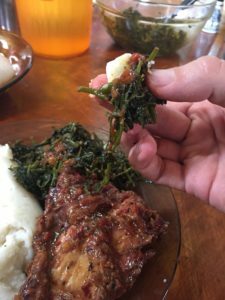 As a follow up to the post on Njama njama, here are some of the other Cameroonian lunches we’ve enoyed. 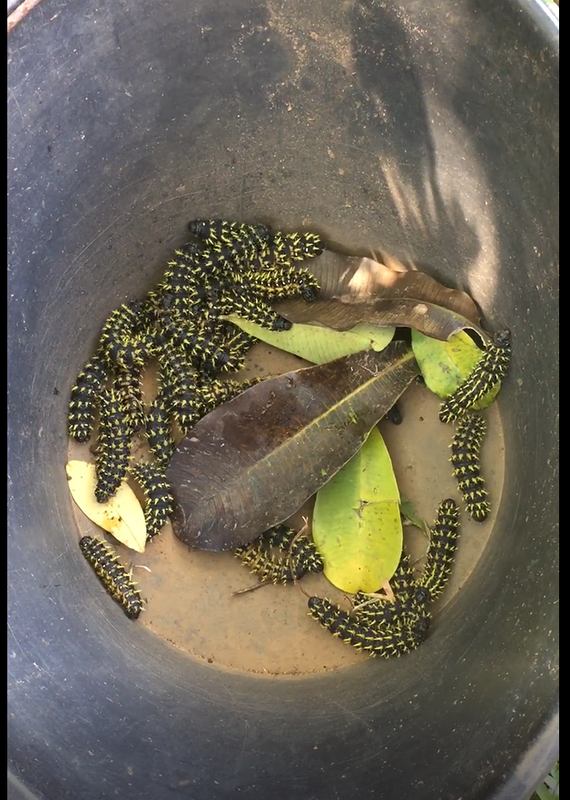 The first is Ndolé. 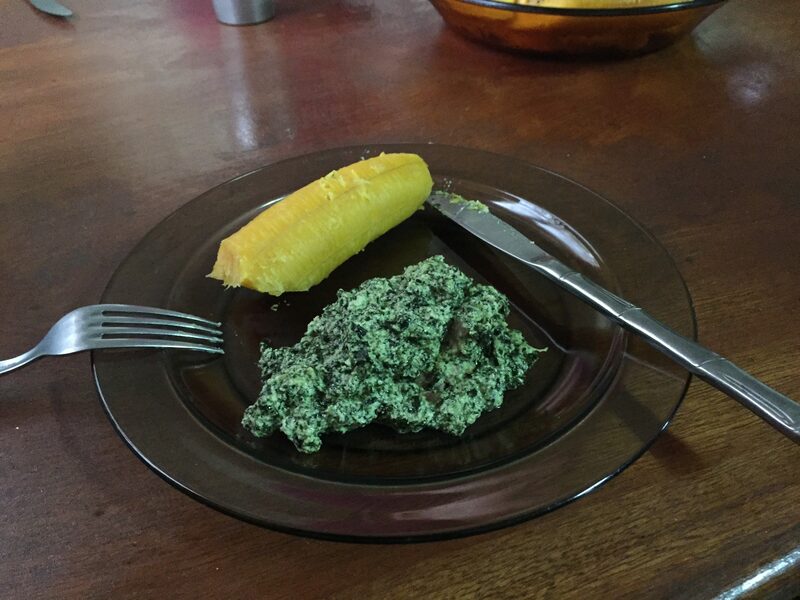 It is a bitter green cooked with a peanut sauce/paste and various meats or fish. This one is with beef. It comes from the Littoral (coastal) region near Douala. 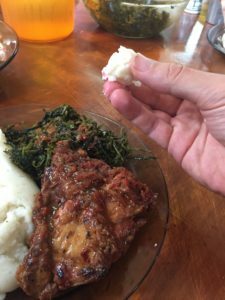 It’s considered the national dish of Cameroon. It’s traditionally served with boiled plantains. Here’s more information. Another dish is Poulet DG (Chicken of the Director General). 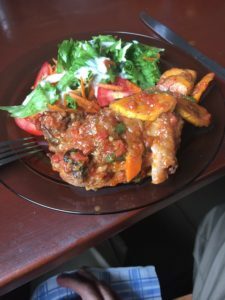 It’s chicken with sauce served with plaintains in the sauce. This is a pretty normal dish by western standards being like any braised chicken dish. Very tasty. As part of our orientation for newcomers to the Cameroon branch, we are provided lunch. We’re on our third week (of three) of the orientation. They started us out on familiar meals like pizza, tacos, and spaghetti. 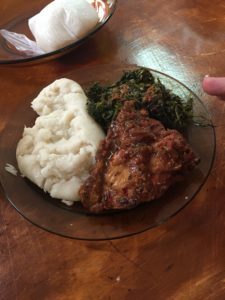 However, now that we’re in the third week they have been introducing lots of Cameroonian dishes (Note: I need to catch up on posting some others we’ve had already). Today for lunch we had Njama njama with corn fufu and Kati kati (smoked chicken). Njama njama is the greens, and corn fufu is basically thick polenta or grits. It was delicious. A few people here have mentioned njama njama to us (plus it’s easy to remember with a name like that) as something particularly tasty in the local dishes here. 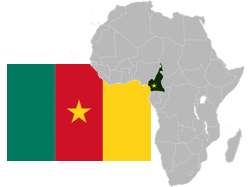 Altough, it’s not really local to Yaoundé, it comes from the english-speaking Northwest region. Also, they didn’t give us cutlery for this lunch, as you eat with you hands using the corn fufu as something to “dip” into the greens with, i.e. your spoon. Also, you must only eat with your right hand as your left is reserved for “dirtier” purposes. For me, as a lefty, it’s a bit awkward at first. Njama njama, corn fufu, and kati kati. Bit of corn fufu in a little ball. Then together with the njama njama and eat. 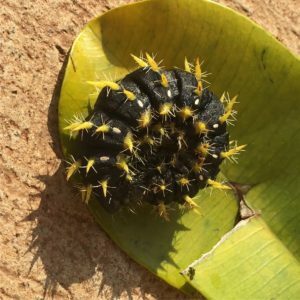 Highly recommended next time you are in Cameroon. We also got a demonstration in the kitchen for how to make it. It didn’t see too difficult. Here’s a recipe for you to make it yourself.